There are awe-inspiring views from the screened balcony at each of the North Myrtle Beach vacation rentals at Egret Pointe South in North Myrtle Beach, South Carolina. This North Myrtle Beach resort is just a couple blocks away from the Atlantic Ocean and it right on the salt marsh. The screened balcony overlooks the marsh and because these balconies are furnished you can really lounge around and gaze at the tranquil views. 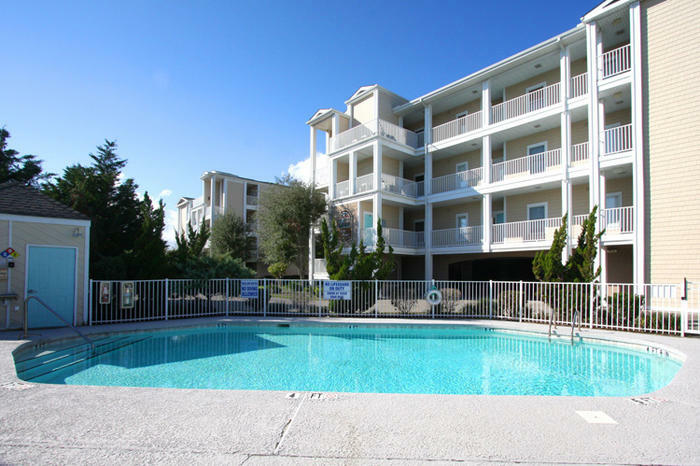 This North Myrtle Beach resort has three stories of condominium rentals. There are two sets of stairs and an elevator located near the parking lot so you can quickly get from your car to your North Myrtle Beach vacation rental. Carrying luggage, groceries and souvenirs into your North Myrtle Beach condo is quite easy, especially because there are only three North Myrtle Beach vacation condominiums on each floor of this North Myrtle Beach resort. This elegant little community in the Cherry Grove section of North Myrtle Beach, South Carolina has a sparkling blue swimming pool for your use during your North Myrtle Beach vacation. It is a fenced in swimming pool and the sun deck surrounding this beautiful pool is laden with chairs, chaise lounges and even an umbrella. Make yourself at home poolside and enjoy the fresh air, refreshing water and relaxation that come naturally. Egret Pointe South is a charming North Myrtle Beach resort that features two-bedroom North Myrtle Beach rentals. These North Myrtle Beach condo rentals are beautifully furnished and will make a very nice headquarters for your family’s North Myrtle Beach vacation. These condos in North Myrtle Beach, SC sleep six people quite nicely. In addition to the pair of private bedrooms, these North Myrtle Beach vacation rentals feature a comfortable living room, dining area, breakfast bar and well equipped kitchen. These North Myrtle Beach rentals have the same modern conveniences as your own home. Everything from a dishwasher and microwave to a washing machine and clothes dryer are provided for your family’s use in these North Myrtle Beach rentals. A DVD player, more than one television and all the cookware, dishes and utensils you might need are at your fingertips in these North Myrtle Beach condominiums. One of the best features of the North Myrtle Beach rentals at Egret Pointe South is the screened balcony that each of these condos has. Don’t worry about any bugs during your North Myrtle Beach vacation. When you have a screened balcony you can sit outside any time, even late in the afternoon in springtime, and you will not be bothered. Listen to the marsh grasses sway back and forth and watch for birds and kayakers as you simply relax on your balcony. Egret Pointe South really is a delightful North Myrtle Beach resort for families. This North Myrtle Beach resort is a block away from Sea Mountain Highway which takes you to Highway 17 and Little River. That fact alone makes this North Myrtle Beach vacation ideal because of your close proximity to the road that leads to all of the shopping, dining, water sports, Myrtle Beach golf courses, live entertainment theatres and Myrtle Beach area amusements. Put your family minutes away from all the fun things they want to do during your North Myrtle Beach vacation. Highway 17 leads to the outlet malls, Barefoot Landing, Broadway at the Beach and The Market Common for shopping. Whether you want name-brand favorites, outlet store prices or the charm of the one-of-a-kind retail stores that dot the Myrtle Beach landscape, you will be near them all when you sleep at Egret Pointe South. Restaurants are on just about every corner. Locals’ favorites, seafood buffets, Italian restaurants, Mexican eateries, Japanese grills and burger joints are easy to find. For breakfast, lunch and dinner your family may eat seafood in the North Myrtle Beach area. Dine on shrimp and grits three times a day. Snack at the raw bar and feast on oysters, flounder, grouper and crab cakes during your North Myrtle Beach vacation. Get ready to get wet when you engage in local water sports. The North Myrtle Beach area has everything from water slides and lazy rivers to parasailing and banana boat rides. Rent a Sea Doo on the ocean or on the Intracoastal Waterway and rent a kayak for a quiet paddle. There are canoes, jon boats and pontoon boats for rent. Hire a deep-sea fishing charter to take you to the Gulf Stream for some memorable fishing. Visit the fishing piers and cast your line in the water from a popular pier. Playing on and in the water during your North Myrtle Beach vacation is loads of fun. Two staples in North Myrtle Beach, SC are the golf courses and the live entertainment theatres. Golf some of the more than 100 Myrtle Beach area golf courses during your North Myrtle Beach vacation and see a show at one of the seven live entertainment theatres that cater to families. Elliott Beach Rentals is not affiliated with onsite management or the HOA of Egret Pointe South.